The vagus nerve is the longest of the cranial nerve. Its name is derived from Latin meaning "wandering". True to its name the vagus nerve wanders from the brain stem through organs in the neck, thorax and abdomen. The nerve exits the brain stem through rootlets in the medulla that are caudal to the rootlets for the ninth cranial nerve. The rootlets form the tenth cranial nerve and exit the cranium via the jugular foramen. Similar to the ninth cranial nerve there are two sensory ganglia associated with the vagus nerve. They are the superior and inferior vagal ganglia. The branchial motor component of the vagus nerve originates in the medulla in the nucleus ambiguus. The nucleus ambiguus contributes to the vagus nerve as three major branches which leave the nerve distal to the jugular foramen. The pharyngeal branch travels between the internal and external carotid arteries and enters the pharynx at the upper border of the middle constrictor muscle. It supplies the all the muscles of the pharynx and soft palate except the stylopharyngeas and tensor palati. These include the three constrictor muscles, levator veli palatini, salpingopharyngeus, palatopharyngeus and palatoglossal muscles. The superior laryngeal nerve branches distal to the pharyngeal branch and descends lateral to the pharynx. It divides into an internal and external branch. The internal branch is purely sensory and will be discussed later. The external branch travel to the cricothyroid muscle which it supplies. The third branch is the recurrent branch of the vagus nerve and it travels a different path on the left and right sides of the body. On the right side the recurrent branch leave the vagus anterior to the subclavian artery and wraps back around the artery to ascend posterior to it. The right recurrent branch ascends to a groove between the trachea and esophagus. The left recurrent branch leaves the vagus nerve on the aortic arch and loops posterior to the arch to ascend through the superior mediastinum. The left recurrent branch ascends along a groove between the esophagus and trachea. Both recurrent branches enter the larynx below the inferior constrictor and supply intrinsic muscles of larynx excluding the cricothyroid. The visceromotor or parasympathetic component of the vagus nerve originates from the dorsal motor nucleus of the vagus in the dorsal medulla. These cells give rise to axons that travel in the vagus nerve. The visceromotor part of the vagus innervates ganglionic neurons which are located in or adjacent to each target organ. The target organs in the head-neck include glands of the pharynx and larynx (via the pharyngeal and internal branches). In the thorax branches go to the lungs for bronchoconstriction, the esophagus for peristalsis and the heart for slowing of heart rate. In the abdomen branches enter the stomach, pancreas, small intestine, large intestine and colon for secretion and constriction of smooth muscle. The viscerosensory component of the vagus are derived from nerves that have receptors in the abdominal viscera, esophagus, heart and aortic arch, lungs, bronchia and trachea. Nerves in the abdomen and thorax join the left and right vagus nerves to ascend beside the left and right common carotid arteries. Sensation from the mucous membranes of the epiglottis, base of the tongue, aryepiglottic folds and the upper larynx travel via the internal laryngeal nerve. Sensation below the vocal folds of the larynx is carried by the recurrent laryngeal nerves. The cell bodies that give rise to the peripheral processes of the visceral sensory nerves of the vagus are located in the inferior vagal ganglion. 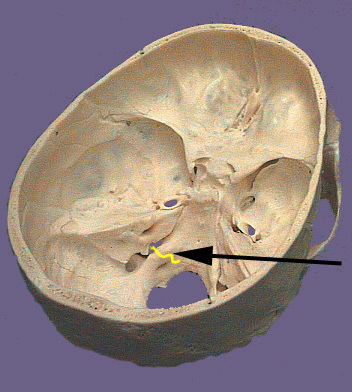 The central process exits the ganglion and enters the brain stem to terminate in the nucleus solitarius. The general sensory components of the tenth cranial nerve conduct sensation from the larynx, pharynx, skin the external ear and external auditory canal, external surface of the tympanic membrane, and the meninges of the posterior cranial fossa. Sensation from the larynx travels via the recurrent laryngeal and internal branches of the vagus to reach the inferior vagal ganglion. Sensory nerve fibers from the skin and tympanic membrane travel with auricular branch of the vagus to reach the superior vagal ganglion. The central processes from both ganglia enter the medulla and terminate in the nucleus of the spinal trigeminal tract.